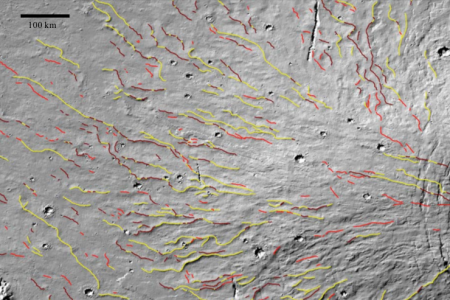 During oral presentations today at this week’s 50th Lunar and Planetary Science Conference in Texas, scientists revealed [pdf] a map showing what they believe are numerous lava tubes flowing down the western slope of the giant Martian volcano Alba Mons. 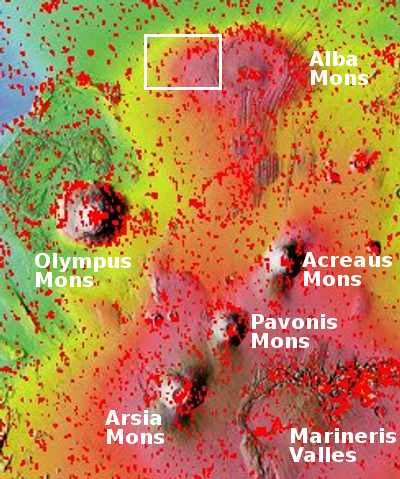 Lava tube systems … occur throughout the western flank, are concentrated in some locations, and are generally radial in orientation to Alba Mons’ summit. Lava tubes are typically discontinuous and delineated by sinuous chains of elongate depressions, which in many cases are located along the crests of prominent sinuous ridges. Lava tube systems occur as both these ridged forms with lateral flow textures and more subtle features denoted by a central distributary feature within the flat-lying flow field surface. Significant parts of the sinuous volcanic ridges show no collapse features, indicating a distinctive topographic signature for Alba Mons’ lava tubes. Alba Mons is in some ways the forgotten giant volcano on Mars. It is part of the same volcano region of all the giant volcanoes, sitting north of Olympus Mons and the more well-known chain of three volcanoes to Olympus Mons’ east. Unlike those volcanoes, Alba Mons is less distinct and thus not as dramatic. Instead of rising to a great height, it is spread over a much larger area, with a much more gentle slope on its flanks. The map to the right shows this region, with the location of the lava tube image above indicated by the white box. These remnant tube sections suggest that the lava tubes flowing down from Alba Mons were quite long, far longer than anything found on Earth. This research has only located tube sections that have either collapsed or are expressed as a ridgeline. It has not found any actual underground voids. However, I would suspect that many of the collapsed sections are connected with sections that remain unchanged and run for miles underground. These are surface lava tubes, the mountain is probably honeycombed miles deep with more tubes that were covered by lava flow and forgotten. A future metroplex housing millions of colonist, farms, animals with room to grow.